On our last visit we only spent a couple of nights in Tokyo so we decided to spend a bit more time exploring one of the largest cities in the world. As it is such a large place you have to decide where you want to stay, there are lots of hotels - none particularly cheap. 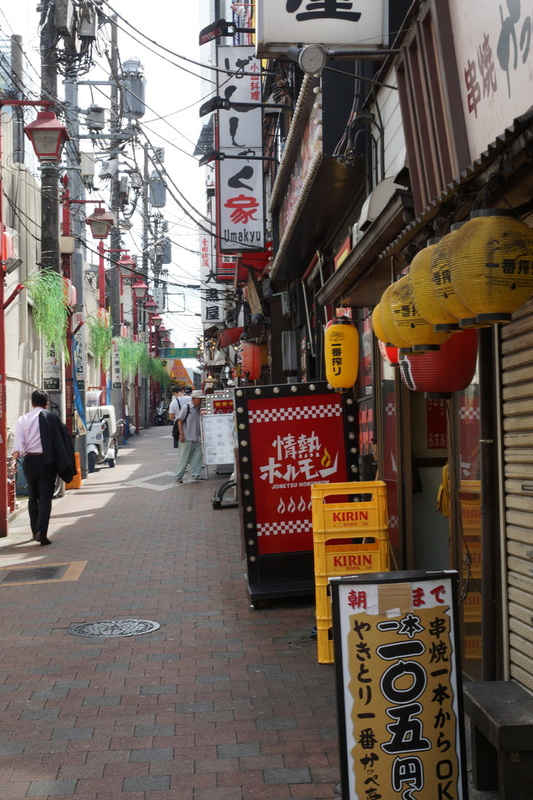 Last time we settled on the Ueno district as we knew that there was a direct train line from the airport and after a long flight we didn't want to have to conquer the Japanese transit system, we opted to return to Ueno this time. We had a lot of Avios points that needed using and so put these towards paying for our hotel but suspect you could have got something similar by trying Booking.com which is how we found our hotel in 2014. 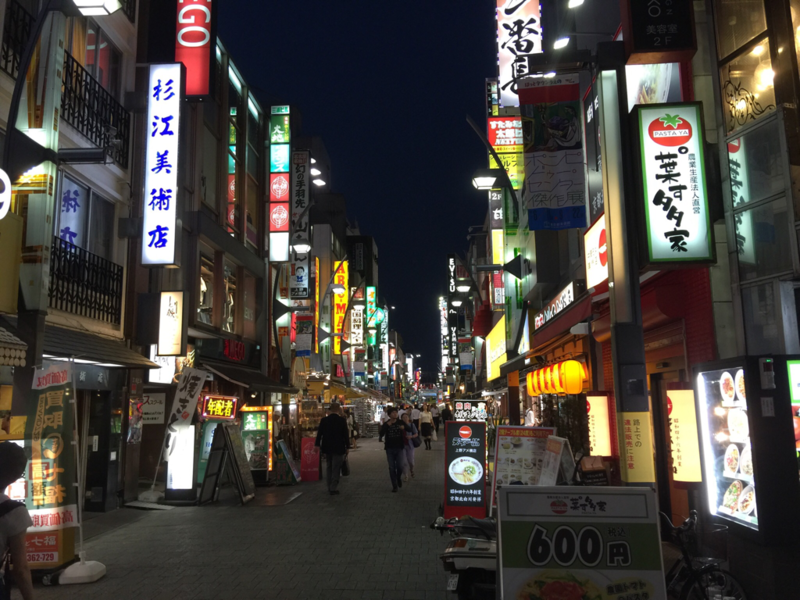 The flight to Narita was 11 hours, we were adequately fed and watered by KLM, and as Japan is 8 hours ahead it was daylight again by the time we arrived. The immigration process was as impressive as last time - helpful people to direct you to the right queue, very short waiting times, quick processing and both our bags turned up on the carousel. 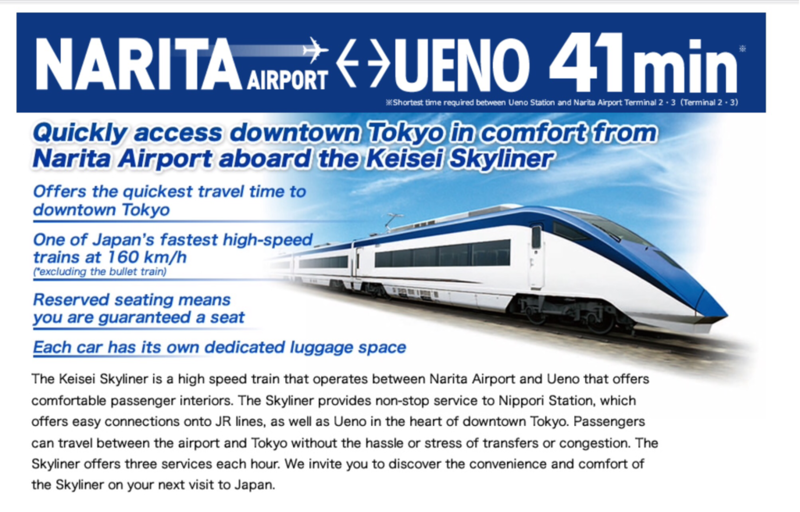 Sheila had booked tickets online for the Keisei Skyliner. Tickets can be bought before you arrive in Japan (http://www.keisei.co.jp/keisei/tetudou/skyliner/us/ae_ticket/) and this train leaves Narita Airport and is a fast train into Tokyo Station, stopping at Ueno and Nippori on the way. We quickly switched our print-out for real tickets at a counter in the airport, staff speaking good English. The ticket gives your carriage and seat numbers on a gleaming, spotless train downstairs, which sets off on time and goes at 100mph (really!). What a contrast to getting a train out of Stansted. 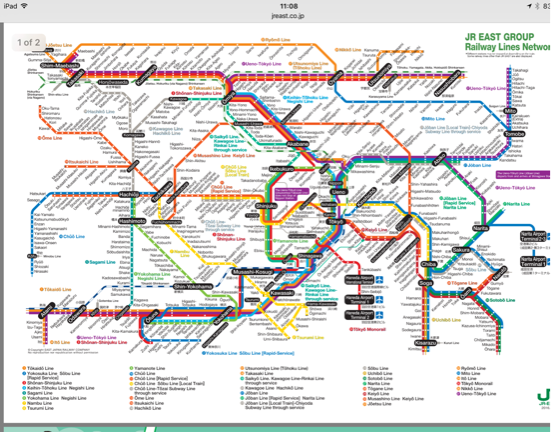 The real challenge started at Ueno Station - how to find the hotel. We had a map and an App, but depending on the latter proved a mistake, the signal was not fast enough and we were between high buildings too. We were all at sea until a helpful shopkeeper lady looked at the map and sent us in the right direction - typical of the Japanese we have met, always very helpful. 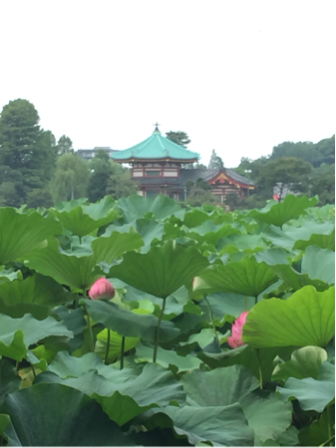 We could not check into the hotel until 14.00 so we left our bags at reception and went for a walk to the nearby Ueno Park where a lake of huge lotus flowers was displaying the last of the flowers as well as lots of Pokémon hunters which were to be a constant presence on this trip. 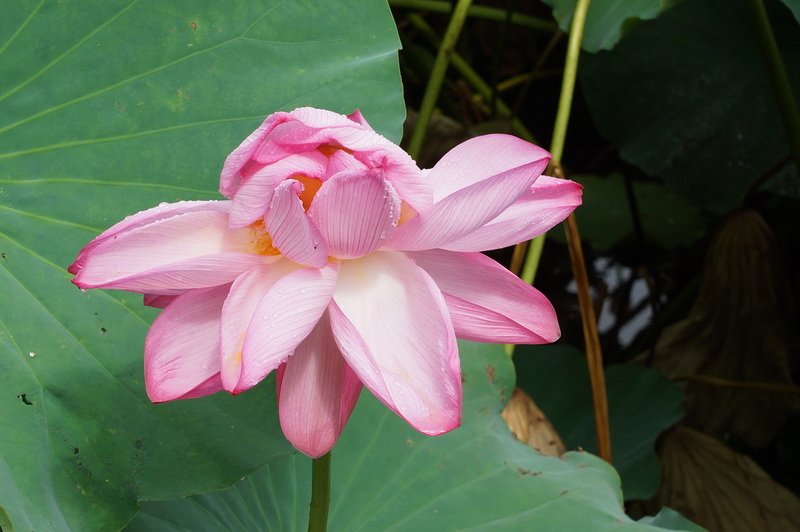 ​As you can see from the photo below this park has a large lake but it also has a museum and a zoo. 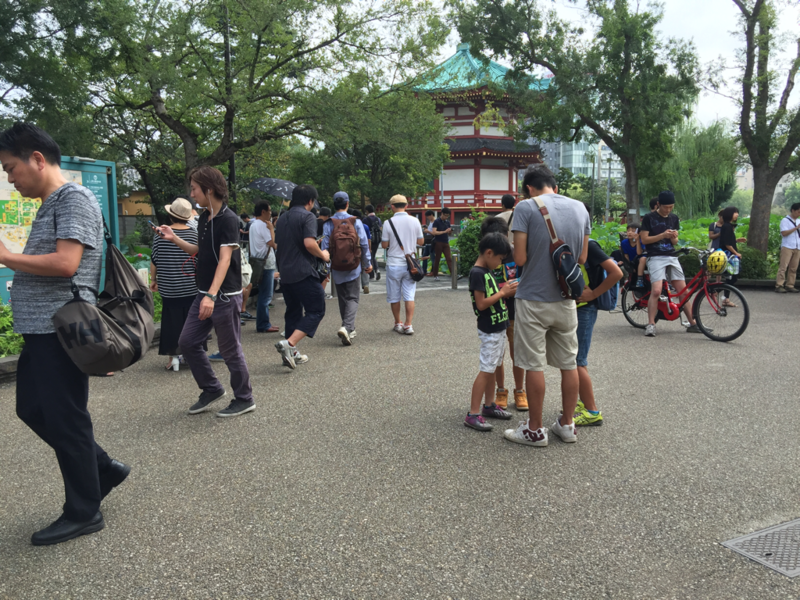 We decided to do the open-air bus tour of Tokyo on our first day. It's the standard hop on hop off bus with commentary . 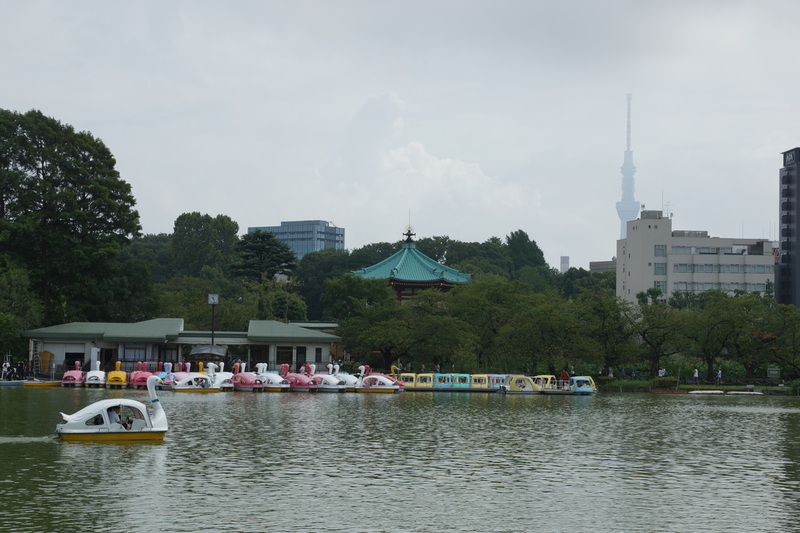 This started with the Asakusa (blue) line and took us across the river and down to the SkyTower which we visited last time and then uptown via the Nipponbashi business district to the Imperial Palacewhere we got off and and then walked to the park . Not very exciting, but,it was very hot and sticky which tends to dampens your enthusiasm. 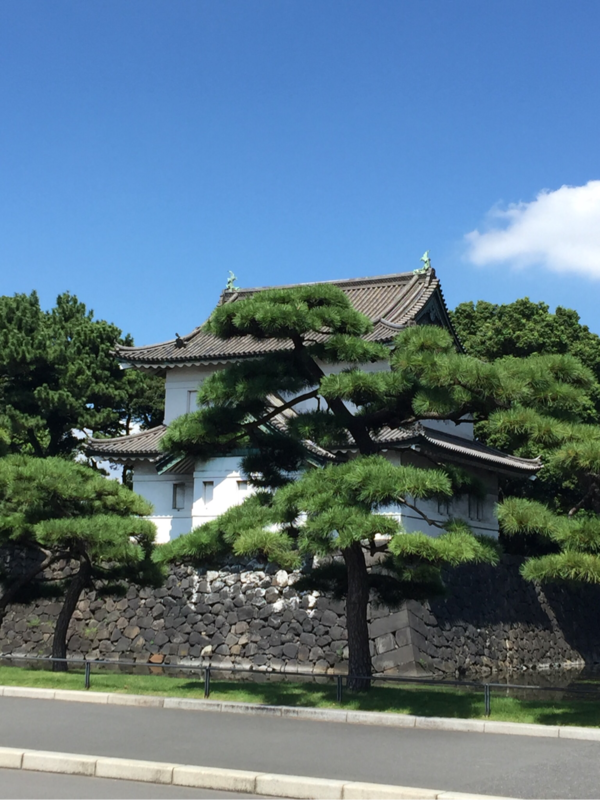 We didn’t join the queue for the Imperial Palace tour - it was still hours away and the queue was already close to the maximum allowed each day, besides it was done only in Japanese, and you have to stick with the tour. 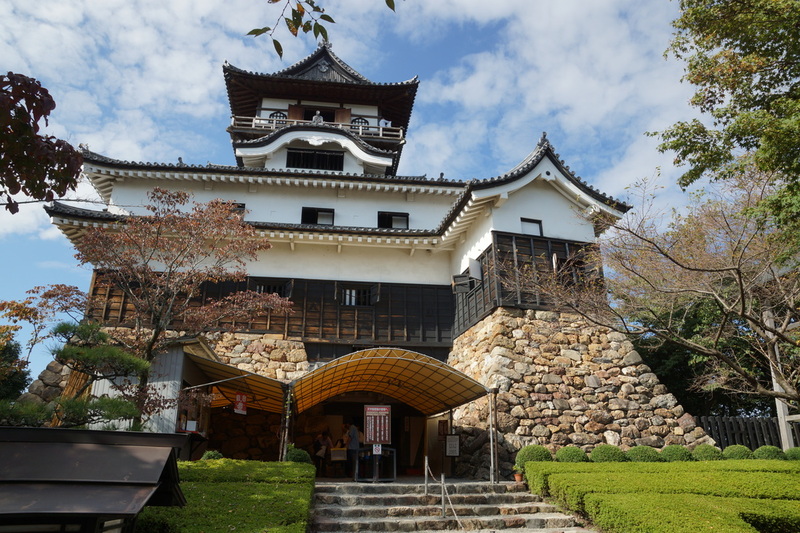 We did the Kyoto Imperial Palace tour like this last time. 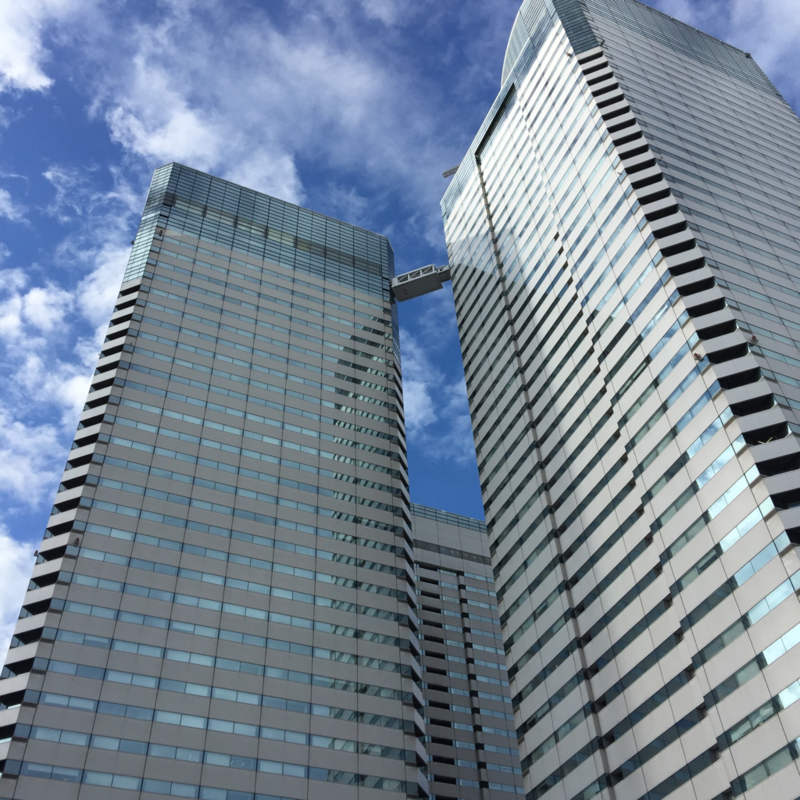 Instead, we walked back to Tokyo railway station (recently restored to its original 1916 splendour), a Jazz Festival at the nearby conference centre, and then the very upmarket Ginza shopping area. In the Tokyo Plaza we were able to photograph a six-way pedestrian crossing, buy some Tokyo 2020 Olympics bits for the grandchildren. 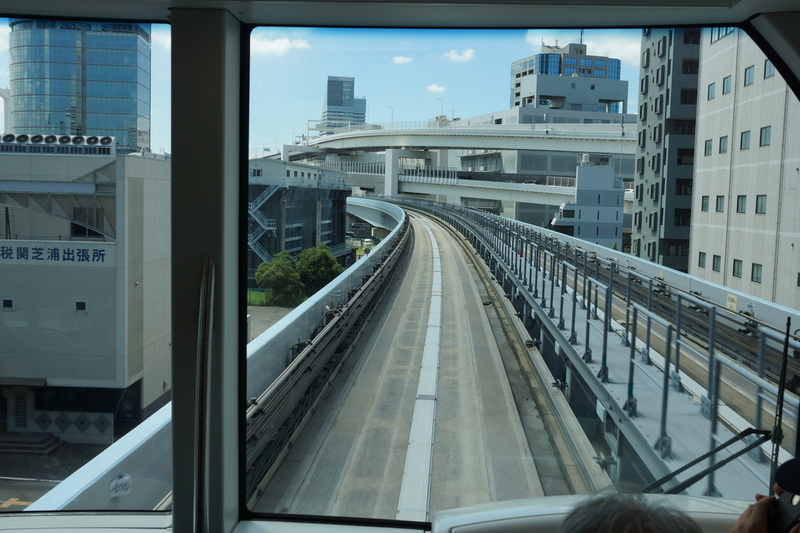 We then returned to the tour terminus and got the Daiba (purple) line which provided splendid views of the waterfront areas of Tokyo and the Tokyo Tower (an Eiffel-tower lookalike) plus a lot of other very tall and/or exciting. 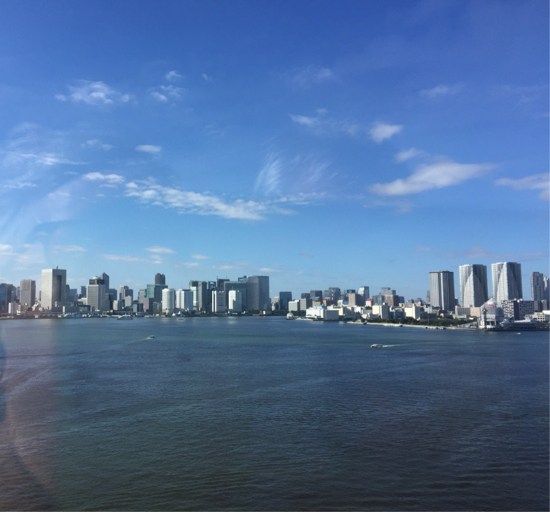 Its not the most romantic way to see Tokyo but you do get to see the main sites. Later in our stay we returned to the waterfront area which we had seen briefly from the bus tour. 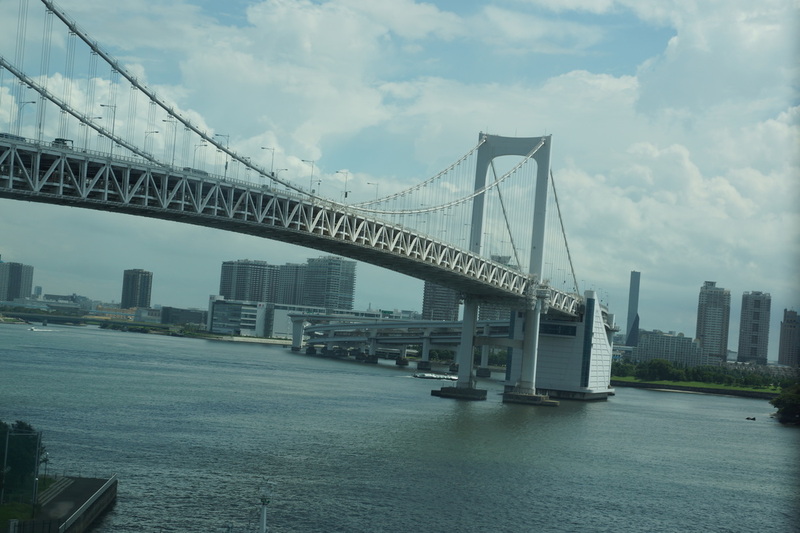 This involved a JR (rail) ticket from Ueno to Shimbashi and then a guided bus (driverless - RMT note that it can be done without killing everybody) on the Yurikamome (Black-Headed Gull, but we never saw one) line to Daiba (a recently created island in Tokyo Bay). The Guided bus is excellent - it looks and feels exactly like a train but is very quiet (rubber wheels running on a concrete path), very fast and very flexible so it can go round tightish bends a real train would never manage. It is all elevated so doesn’t get the chance to run over pedestrians, who would anyway always wait for the green man before crossing. This area of the waterfront was originally designed for housing but the recession hit so instead it was developed as an entertainment/shopping complex. We got off at Decks which has a massive “Joypolis” games centre which looked (from the outside) both complex and frightening so we did not enter. 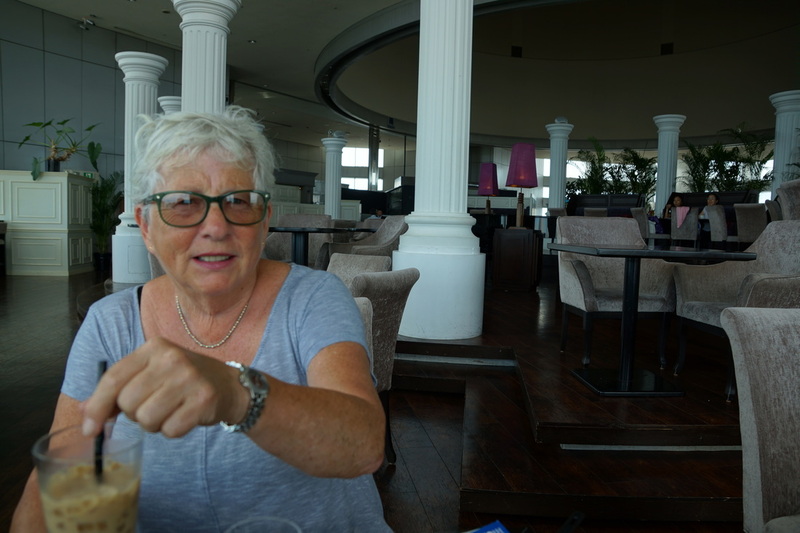 Instead we had a beer at a bar on one of the upper floors which provided great views over the bay and the “Rainbow Bridge” (so-called because it lights up nicely at night). 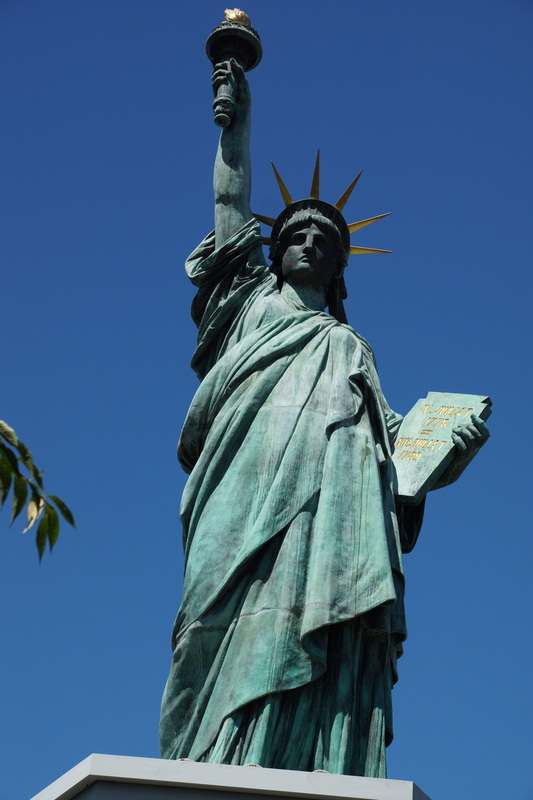 Further round the bay there was a large reproduction of the Statue of Liberty (not sure why). 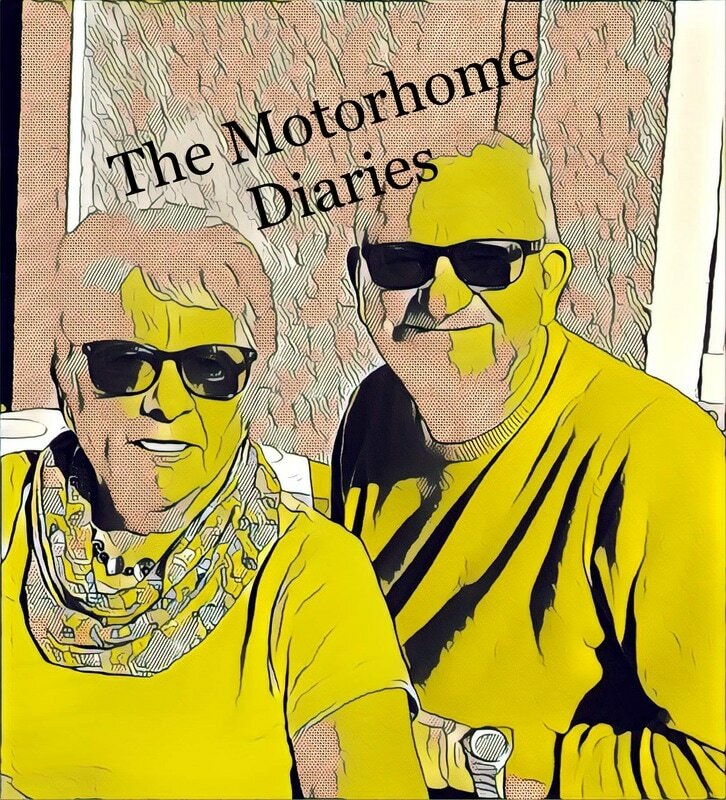 We were going to look at the Fuji TV Headquarters but it was the dreaded Monday ….. so it and several other places were shut. We then walked to the National Museum of Emerging Science and Innovation. We paid to go in but cannot remember how much (so presumably quite reasonable). It was largely geared up for kids but entertaining enough for adults - we saw the Honda robot Asimo do his stuff, and sat through a live 15-minute presentation (in Japanese only) on superconductivity. There was also a lavatory from the Space Station, looking a bit 1930s. We then walked to Palette Town but again it was shut so we looked at the Big Wheel (too frightening for one of us) and then round the adjacent games complex where you could use grab-cranes to win fluffy toys, fail to win from money-shovers, and possibly win (but not money, only tokens which could be used until you lost them all) on one-arm bandits of fiendish complexity. The waterfront area is certainly worth visiting, you could spend the day here - but not mondays. Returning on the guided bus/train we had some excellent views of the Rainbow Bridge, the bus/rail track and the Bay buildings. 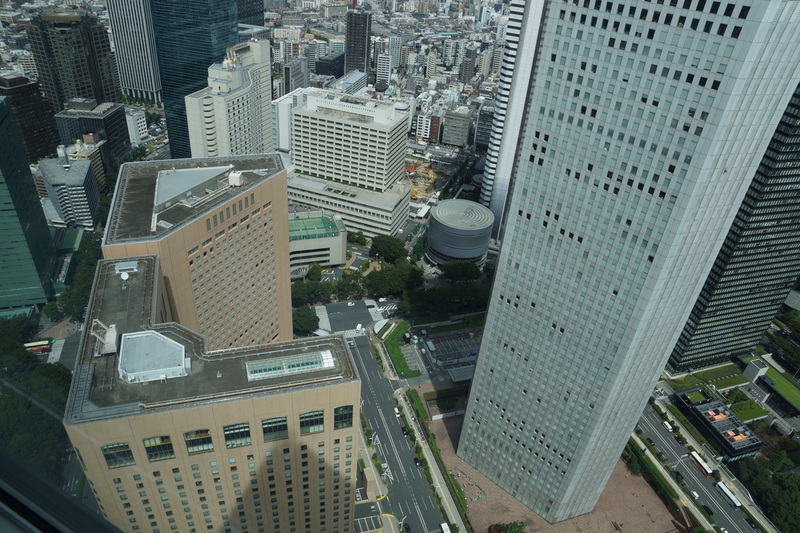 The Shinjuku district is in the west of Tokyo. We started at the Tokyo Metropolitan Government buildings but to get there from Shinjuku Station we went along about 1km of underground moving pavement which was most impressive, it was nice and cool down there too. Both towers of the TMG buildings have observation towers but we chose the North and joined the well-ordered queue for the lift to the 45th floor (which took a shade less than a minute and involved some ear-popping). The views from the top were tremendous, and you could see My Fuji in the distance. 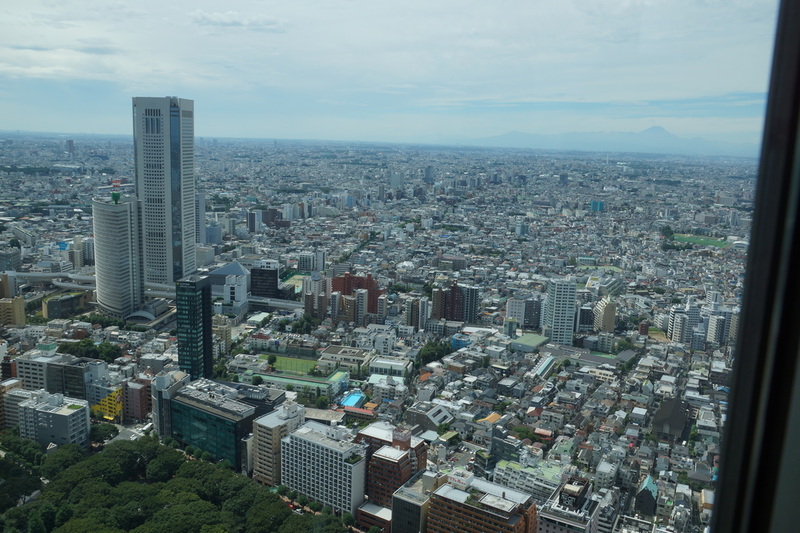 The TMG building is a great way to get a spectacular view of Tokyo for free. You get a similar view if you go to the Sky Tower but you have to pay, though it is exciting - especially the rapid lift. 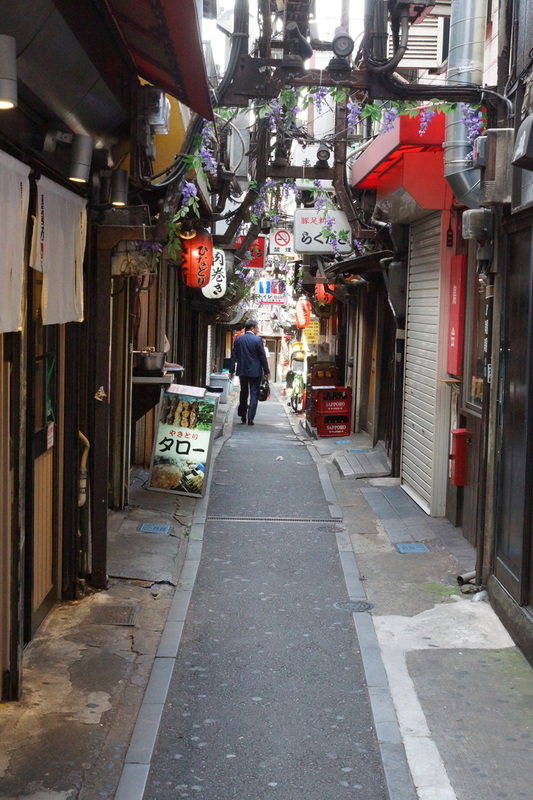 ​From the TMG buildings we walked to Omoide Yokochō (also known as Piss Alley), a very small area of narrow lanes packed with tiny eateries. 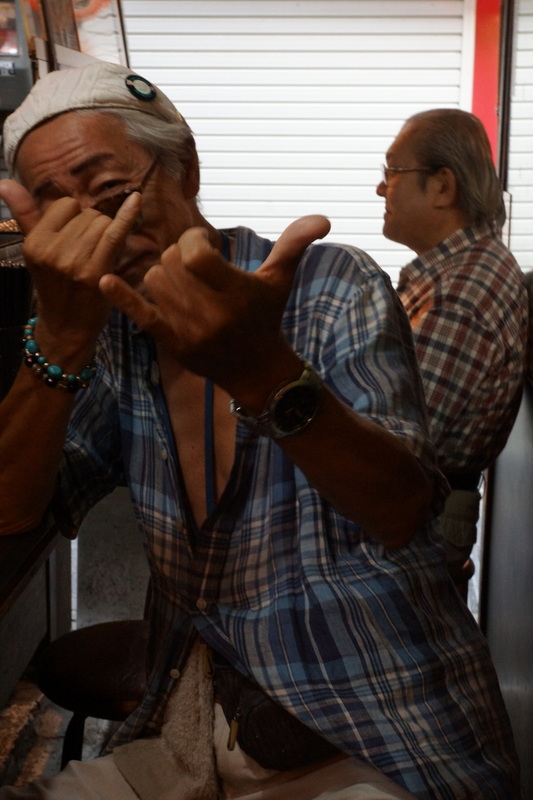 We had some vegetarian yakitori and a beer in a tiny place little more than six feet wide and dozen feet deep, and managed to find the local drunk who could speak (sort of) English. 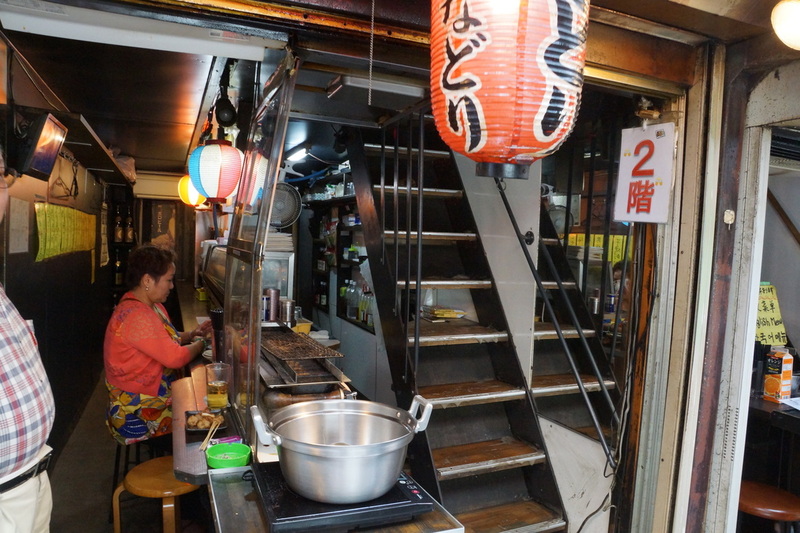 We walked on to the Kabuchicō area, reputedly the seediest part of Tokyo where we hoped to see the “primped and preening” touts who lure women into male host bars. Regrettably they were absent, perhaps it was too early in the day, and we also had trouble identifying the women-seeking-men dives from the more usual opposite. We are clearly unpractised in reading the signals. 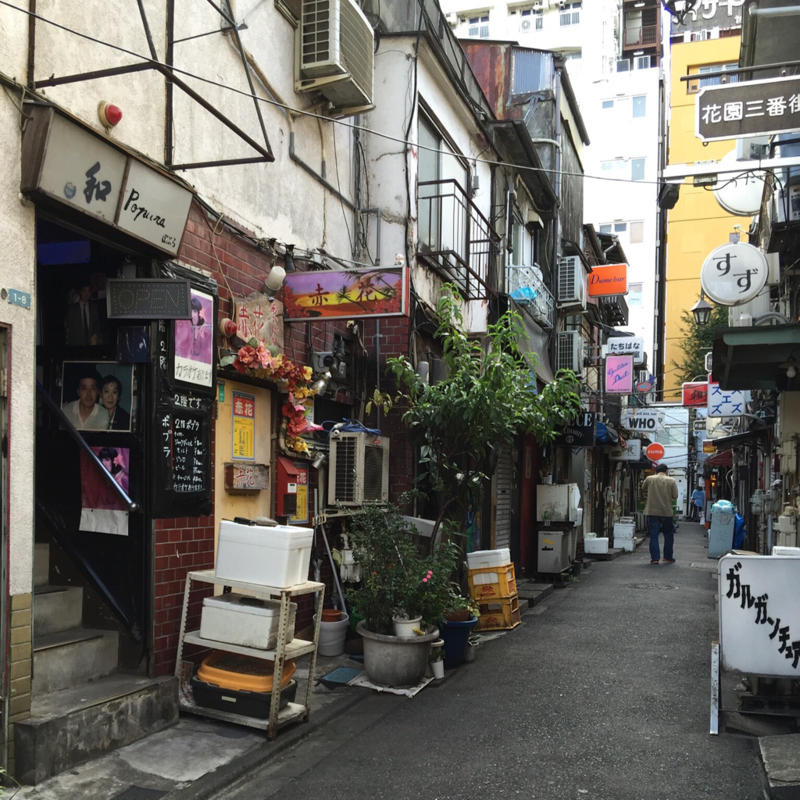 From there - via a helpful shop assistant - we visited the alleys of Golden Gai, a tiny area full of tiny bars with a dubious reputation. Rather unexciting at 2pm but the whole place looked promisingly rough.